Take a look above and to the right at the inventory of pots at Springdale. This is only a portion of them! You've got come see them to believe it! What a great way to make a really beautiful addition to your landscape! You choose heavy ceramic pottery, a statue or a stone fountain and build your own water feature. Put your disappearing fountain where you can see it from your home and patio. Sun or shade doesn't matter like it does for a water garden. A disappearing fountain can be placed anywhere you want the look and sound of flowing water. The photos below show various examples of disappearing fountains and many of our vases made of the highest quality oriental pottery. New photos are added occasionally. Please check out some of our pottery collections to see the colors, textures, sizes and shapes on the Disappearing Fountain Vases, Statuary and Pottery page! Click on the link to the left. The complete 4' x 4' square basin assembly is shown on the bottom of this stack. Use this size basin to make most fountains. You can do larger pieces and even multiple vases on this size assembly. Approximate water volume, 100 gallons. 4' x 4' heavy plastic mesh - keeps decorative stone from falling through the grate. Ships via truck - You pay actual freight. Extra freight charge of $125 or higher will be added to shipping charges. Amount added depends upon where you live. We will quote freight before shipping. *** Must ship by truck. Please call us for a rate quote. The complete 3' x 3' square basin assembly is shown in the middle of this stack. Use this size to make a medium-sized fountain. You would usually do only one fountain piece on this box, but it is possible to do a small three piece set-up. You just have to be able to contain the splash when using multiple pieces. Aproximate water volume, 65 gallons. Ships via UPS - You pay actual freight. Extra freight charge of $115 or higher will be added to shipping charges. Amount added depends upon where you live (mainland US). We will quote freight before shipping. The complete 2' x 2' square assembly is shown on top of this stack. Use it to build your small disappearing fountain on. You would usually have only one fountain piece on a box this small. Approximate water volume, 25 gallons. 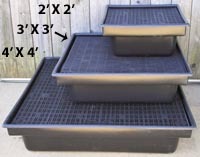 2' x 2' heavy plastic mesh - keeps ornamental gravel from falling through the grate. Ships via UPS - You pay actual freight. Extra freight charge of $35-85 will be added to shipping charges. Amount added depends on where you live (mainland US). We will quote freight before shipping. 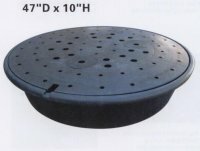 47" diameter round disappearing fountain reservoir assembly. 10" deep. Approximate water volume, 80 gallons. Ships via truck - You pay actual freight. Estimated freight charge of $125 or higher will be added to shipping charges. Amount added depends upon where you live. We will quote freight before shipping. 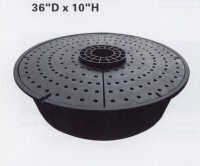 36" diameter round disappearing fountain reservoir assembly. 10" deep. Approximate water volume, 45 gallons. Ships via UPS - You pay actual freight. ***Please call us for a rate quote. 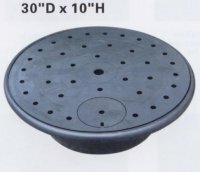 30" diameter round disappearing fountain reservoir assembly. 10" deep. Approximate water volume, 20 gallons. The four foot square basin is available separately if you want to provide your own grate and mesh. 4' 4' inside dimensions and 12" deep. Use with 4' x 4' grate and mesh. Ships via truck - You pay actual freight. We will quote freight before shipping. *** Must ship by truck. Please ask for a rate quote. The three foot square basin is available separately for someone who prefers to use their own grating. 3' x 3' inside dimensions and 12" deep. Use with a 3' x 3' grate and 3' x 3' mesh. The two foot square basin is available separately for those who want to provide their own grating. 2x2 foot inside dimensions and 12" deep. Use with a 2' x 2' grate and a 2' x 2' mesh. Matrix is designed to replace gravel traditionally used in a Disappearing Waterfall reservoir or for use in larger Disappearing Fountain applications. Many times more water storage capacity than gravel. 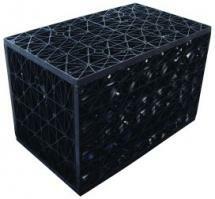 Matrix holds 7.4 gallons water per cubic foot and gravel only holds approx. 2.2 gallons. Easier to clean and less likely to clog than gravel. Less Labor on installation for moving boulders, gravel and other rock. Less maintenance after installation because of greater water volume in basin. Dimensions: 26-1/2" X 16" X 17-1/2"
Dimensions: 26-1/2" X 16" X 9-1/2"
8 oz. bottle treats 9600 gallons of water. For safe and effective control of algae in Disappearing Fountains, Pondless Waterfalls and multi-tiered fountains and birdbaths. EPA registered product kills and inhibits growth of algae without harsh chemicals such as chlorine. Non-hazardous, non-staining, non-foaming formula is completely safe for pets, birds and plants, BUT NOT FOR USE WITH FISH. This treatment controls mosquitos, too! Add weekly to keep fountains looking great. Works best if started before algae begins to grow, but can be added anytime. Protec - Scale and Stain Remover 8oz. 8 oz. bottle treats 200 gallons of water. Monthly application is needed. Use with Fountec Algaecide/Clarifier for best results. Protec was developed to maintain the beauty and appearance of fountain surfaces. Contains a unique formula for superior protection against white mineral deposits and metal stains on fountains. Prevents hard water deposits inside and on the screen of your pump also. Safe for all varieties of birds, pets, plants and animals except fish. NOT SAFE FOR USE IN WATER GARDENS WITH FISH.